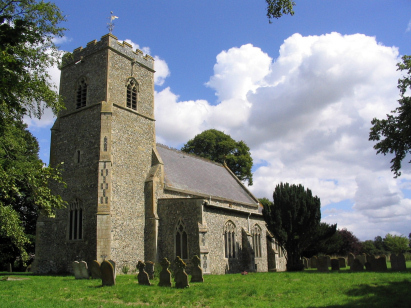 The parish of Winfarthing sits in southern Norfolk, a few miles north of the market town of Diss and the border with Suffolk. The parish is west of the main A140 linking Norwich with Ipswich. The village is a welcome oasis in what is a broad and largely featureless agricultural plain. The present day village is placed largely along the B1077 which links Diss to the Buckenhams and to Attleborough. Much remains of village life with a thriving settlement complete with shops and pub. 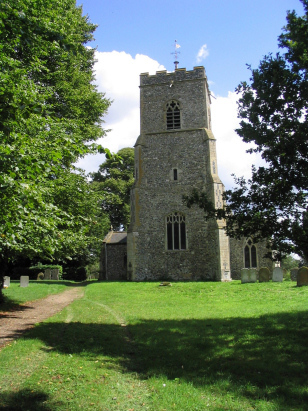 St Mary's church lies at the heart of the village and just east of the B1077 main road. The church is largely in the Decorated style which is indicative of an origin in the early 14th century. The tower and south aisle are later than the main body of the church. The church sits in a very attractive graveyard with many mature trees giving a tranquil setting. The deposit from which this transcript is prepared consists of two standard 800-entry books which are microfilmed on Microfilm MF1632. This film is a quite recent filming and as such is of a much superior quality with clear and contrasting images. The standard of preservation of the two books must also be good as the images are in the majority clear and readable. There is evidence of some abuse to the first register with several pages unused and unfilmed - but there is no break in date sequence indicative of missing entries. As with all transcripts there are entries where some or all of the writing is difficult and an estimation has to take place. It is hoped that these are correct and that few errors will have crept into this transcript.